Since 1991 Midwest Art & Frame has been your manufacturing beautifully framed art at wholesale prices for furniture stores, gift shops and interior designers. All of our custom framed pictures are made in our factory in Minneapolis, Minnesota. If you use our online custom picture framing software you can be sure your order will be made in our Minneapolis, Minnesota factory and always at a wholesale price. Most of the framed pictures in our Instant delivery section will have been made in China. Our "Made In China" wall hangings and mirrors are made using the highest quality standards. We send a picture framer from our factory to inspect every order before it is shipped to our warehouse in the USA, then we inspect every piece before it is shipped to your location so you can be sure of the highest quality. If you are planning a large order of pictures for your project and have a few months why not let us save you some money by producing it in China? When we say "Large" we mean "Really Large!" An interior designer contracted us to make these pictures for a new seafood restaurant. The picture behind me is ten feet wide by three and a half feet tall. 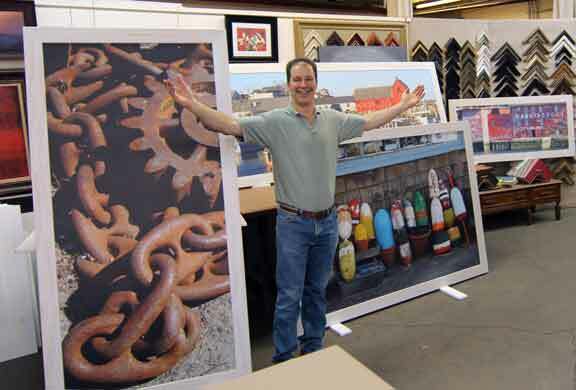 When the need arises we can source the images, print them on canvas or paper using our large format printer, frame them and ship them to the job site. And all at prices that allow you to make a profit! Do you need contract picture framing? An interior designer contracted us to print and frame 297 pictures for a new restaurant location. We also do this for nursing homes, hotels, hospitals, hotels, resorts and more. Click Here to learn more about printing your digital art and framing it your way. Look to us for unique framing. We also do large (quantity) contracts for: Nursing Homes, Hotels, Retirement Centers, and Condo design projects. We can make large pictures up to 60" x 100" in size. With over 500 pictures framed and ready to ship, and over 45,000 stock photographs and art images ready to frame for that interior design project, we can make just about anything you want. If you have a special project contact us by email or telephone 612-623-9771. Whatever your framed art needs are you can satisfy them here. If you are looking for a wholesale source of wall hangings for your furniture store, gift shop, or design project, you've come to the right place!